Advantages of Adding a PVC Picket Fence to Your Property - Mills Fence Co. PVC Picket Fences | Mills Fence Co. When you imagine a picket fence, you probably envision panels made of wood painted white. Such fences are traditional because wood was an easily available material for enclosing your property. However, wood does require maintenance to keep it looking fresh. Enter the vinyl picket fence. Made of PVC, such fences look like wooden picket fences but don’t need as much upkeep. 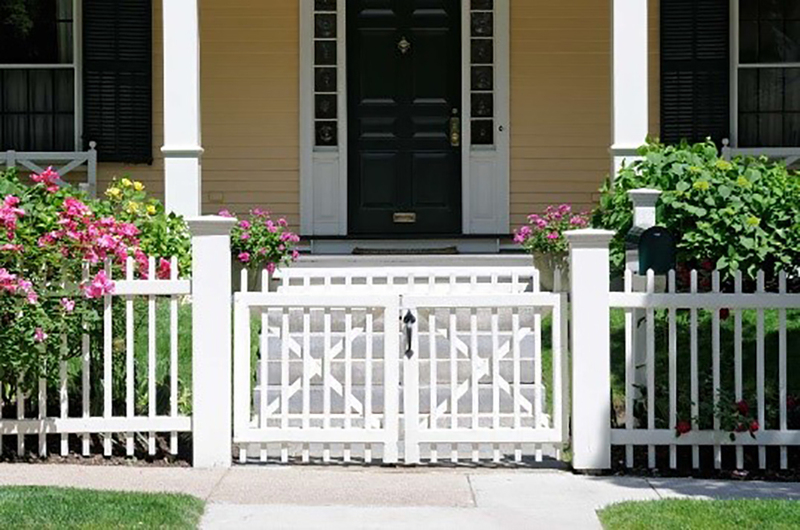 Here are a few reasons that PVC picket fences may be great for your property. In that vein, any vinyl fencing is low-maintenance. Because the vinyl panels come from the factory pre-colored—the vinyl itself is mixed with dye—you never need to paint your fence. If you do see any discoloration, you can wash it off with dish soap and a hose. Indeed, you should probably hose the fence off a couple times a year. Vinyl fencing is also durable. Unlike wood, vinyl fencing isn’t susceptible to rot or wood-loving insects such as termites. Such pests eat wood and cause holes, but they naturally have no taste for vinyl. Likewise, PVC isn’t susceptible to splintering or cracking. Generally speaking, the vinyl remains intact for years. Building a wooden picket fence can be a time-consuming project. The contractors must erect the posts and install first the rails and then the pickets. Depending on the size of your property, this process can take a day or more to complete. With vinyl fencing, manufacturers use polyvinyl chloride to create fencing panels that resemble wooden picket fencing. The contractors must still erect the posts, but they then span the space with the prefabricated panels. The process is much faster than building the fence from scratch. One of the great advantages of picket fencing specifically is the ambiance it creates. Colonists were among the first to erect these simple fences, white-washing the wood to keep insects away. Picket fencing has transcended through the generations, generally becoming symbolic of home and hearth. In the past, carpenters developed different designs and passed the patterns down to the subsequent generation. Modern fence installers can use these patterns to recreate those homey styles in wood. Vinyl picket fencing panels do come in some of the traditional styles even though the panels are prefabricated. Some attractive options are dog-ear tops and scalloped panels. You’ve heard the old adage that fences make for good neighbors. Well, “good and attractive fences keep neighbor relations friendly” is probably more accurate. A rickety fence isn’t going to win you any friends. However, an attractive picket fence enhances the look of both your own yard and your neighbor’s. What’s more, pickets are low, so they won’t obstruct your neighbors’ views. Naturally, one of the tasks for fencing is to define the boundaries of your property. However, even when your fence is well within your property line, it impacts your neighbors. At the very least, they’ll be looking at the fence from their side. Since vinyl is durable and low maintenance, you know they’ll have an attractive view from their side as well. One of the other big duties fences fulfill is keeping your family inside the perimeters of your yard. This is mostly relevant for families with children and dogs. As mentioned above, picket fences are usually low, between two to four feet tall. That height is sufficient for smaller kids and dogs. They’ll be able to see out without being able to get out. The durability of vinyl also keeps your pets and, especially, kids safe. Wood splinters are a problem for kids playing around the fence or dogs rubbing up against it. They can also present problems for cats rubbing on or jumping on top of the fence. Since vinyl doesn’t splinter, you don’t have to worry about this hazard when you unleash the hounds—and kids and cats. Create curb appeal while maintaining utility with an attractive vinyl picket fence. Visit one of the Mills Fence showrooms to speak with customer representatives and see examples of vinyl picket fences.